Do U c WhAt I c ? Do U C what I C? Let’s say a fruit is sitting on the table. We both see it, but your brain sees an apple and mine sees a plum. Quantum physics, and particularly Heisenberg’s Uncertainty Principle, says that as our perception of an object changes so does the object itself. You see why it is called the uncertainty principle? Perception is a tricky thing … handle with care. EMOTIONS! In my world, that is a loaded word. If you come see me professionally, chances are you’re not feeling simpatico. There are two main ways to make people feel better: Drugs and/or hard work. I say hard work because it takes effort to change. I am a talk therapist, meaning I don’t use drugs 😎 I get change by getting you to look at something a different way. Once you can change or accept another perception, your emotion changes. Once your emotion changes, you begin to entertain fresh ideas. No drugs required. 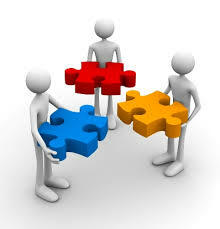 Together, change occurs with the realization that you and me are working on the same puzzle. People that get over-whelmed and fixate on a problem are people that isolate themselves, either physically or mentally. Mental isolation is when you are physically present but mentally absent. When we get together, the realization is everyone has problems like me and are trying to solve them, like me. We only solve a single piece of a billion piece puzzle. Frustration occurs when, after solving a piece, we expect the entire puzzle to come together. Time spent together is time well spent. We have the same tools like belief, doubt, ego, shame’ guilt, responsibility, action, relation, intellect, spirit, faith and love to solve the puzzle. So, with careful consideration of the tools, any unsolvable problem becomes a small piece of a solvable puzzle. After twenty years of practice in psychology I have discover a truth, there are only a few big puzzles. Of the hundreds of people I’ve met, each with a hundred small problems, they all fit into several small or a few big puzzles. I am a better therapist if I reveal the puzzle, instead of focusing on the problem. How you tackle the puzzle is all you. My job is only to change how of you see and to point out the tools. This perception sharpens me as a therapist and improves you, the puzzle solver. Quantum physics proves what I see: As our perception of an object changes, the object itself literally changes. ➡ Can you see how looking and doing the opposite may fix a problem? ➡ Why do think others find it so difficult to except (tolerate) another’s perception? ➡ Do you ever exhibit the traits you just thought of? ➡ Do you consider yourself narrow or open minded?